Google Hangouts is a video conferencing tool developed by Google that allows users to collaborate at a distance, instant message, video chat, and share photos, computer screens, and files. 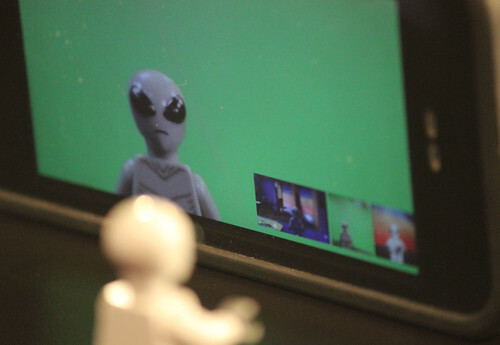 Google Hangouts allows conversations among up to 10 users at the same time. It can be accessed online or through mobile apps available for iOS and Android. Chat histories and files are saved online, and they are available to be synced between different devices. 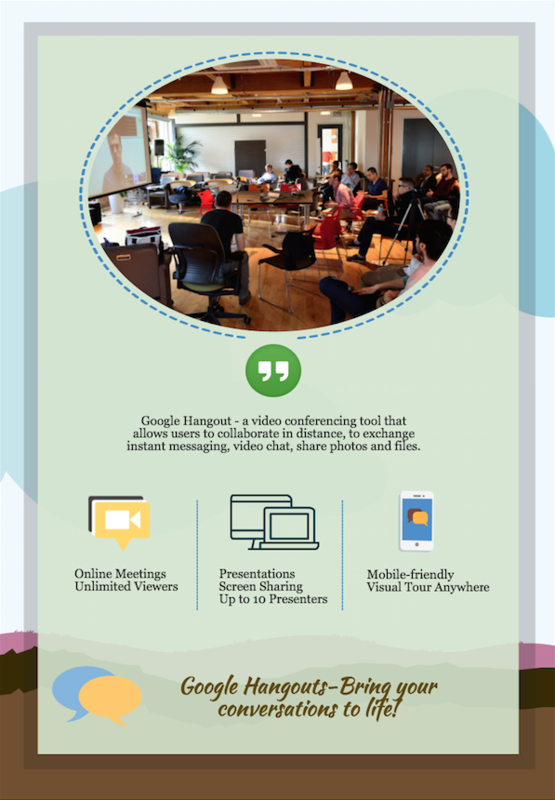 For educators, Google Hangouts is a great tool to engage students in collaboration outside of the classroom. It overcomes geographical barriers and provides more opportunities for face-to-face communication. Ease of Use: The Google Hangout user interface is well-designed and easy to figure out how to use without any instructions. Help articles are available and searchable if you run into any problems while trying to use Google Hangouts. However, users need to sign in with Google Account in order to start a conversation (eg.Video Call, Phone Call and Message) or view help articles. Privacy: Hangouts are private (only you and the people you invite can join and see the chat history). However, similar to other Google apps, Google has full access to the chat history, and can provide this information, as well as personal data, to the government, if it receives such requests. Accessibility: Google Hangouts is organized with headings and landmarks to make it easier to navigate with a screen reader. Screen reader apps, such as JAWS, NVDA, VoiceOver and ChromeVox work well with Google Hangouts on multiple devices. It also supports Hangouts Captions, an app that connects live transcription services directly into a Google Hangout, and keyboard shortcuts in video calls and chat conversations. Substitution: Students use Google Hangout to communicate with other students in the same classroom (rather than having a face-to-face conversation). Augmentation: Students use multiple modalities, including text, emoticons, photos, or drawings to enhance face-to-face conversations. Modification: Students in different states share files and screens to collaboratively work on a class project. 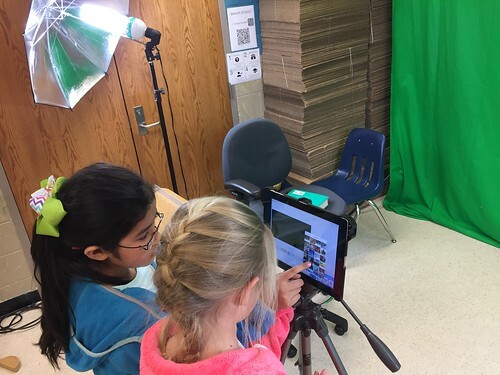 Redefinition: Students connect with experts from all over the world beyond the classroom walls via Google Hangouts. For example, the students can interact in real time with the author of the book they are reading. Google Hangouts – Bring your conversation to life! Geography Host a Mystery Skype session using Google Hangouts. Connect your class with another class (ideally located in a different state or country) and engage your students in the fun challenge of trying to figure out where the other class is located. Collaborative Class Projects Students can use Google Hangout to work on class projects outside of class time. They can brainstorm ideas, exchange files and share screen to work on a group project together. Also, the communication history can be saved for team evaluation evidence. History & Cultures The teacher can use Google Hangout to connect a local tour guide to give a virtual tour of a target city or historical site, having students joined in the conversations with local people. Other In any subjects, the teacher can invite an expert as a guest speaker to talk to students in class through Google Hangouts. For example, invite an author of a book, which students are currently reading as a guest speaker to have a lively chat with students to discuss the book content and students can ask questions through Google Hangouts. Enter the name or email address, click “INVITE”. Click the name, email or phone number in the list, it will start a conversation on the right. Send messages in the bottom line, or click the “Video call” icon on the top. After your partners click “Accept”, the “Hangout Video Call” window will pop-up. You will see the presenter in the centre, your own webcam in the lower-right corner. Click on “people icon” on the top-right to invite more people. Click “Hangup icon” to end the Hangouts. Isaacson, K. (2013, June). An investigation into the affordances of google hangouts for possible use in synchronous online learning environments. In World Conference on Educational Multimedia, Hypermedia and Telecommunications (No. 1). Duke, P., Grosseman, S., Novack, D. H., & Rosenzweig, S. (2015). Preserving third year medical students’ empathy and enhancing self-reflection using small group “virtual hangout” technology. Medical teacher,37(6), 566-571.